Niagara Falls, NY - Chief Nursing Officer JoAnn Pellegrino and Clinical Coordinator of Patient Care Services Janet Kundl show off one of the new Cardiac/Stroke Care Unit patient rooms. Niagara Falls Memorial Medical Center celebrated the official opening of the new $4.3 million Cardiac/Stroke Unit. Niagara Falls Memorial Medical Center today celebrated the opening of a new $4.3 million Cardiac/Stroke Care Unit that officials said closes the loop on a complete continuum of care for patients with cardiovascular disease. 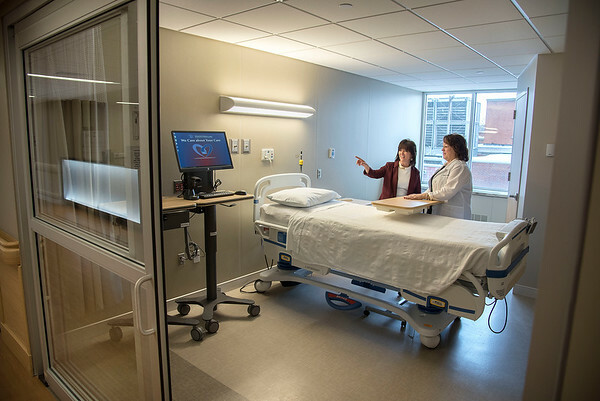 The 12,950-square-foot facility is on the hospital’s third floor and features 23 private rooms, including six higher acuity step-down rooms, along with an in-unit physical and occupational therapy facility to encourage quicker patient recovery. It replaces an outdated, 40-year-old telemetry unit on the hospital’s fourth floor. The unit’s rehabilitation component will feature leading edge visual-motor and neuro-cognitive rehabilitation equipment that employs programmable, customizable testing and rehabilitation routines. Patients and their caregivers also will benefit from the unit’s dedicated Patient-Family Resource Center. “This will provide a comfortable space for members of our nursing staff to provide education on cardiovascular disease and instruct patients and their families on how to successfully transition from the hospital to home and community,” said Memorial Chief Operating Officer Sheila K. Kee.